At Digital Dogs, we offer a whole schmear of website services – web design, web development, and all kinds of online marketing (SEO, PPC, social media). However, some clients come to us looking for a specific service. Perhaps they already have a great web design, and they just want to increase online visibility, so they sign up for SEO and PPC. Sometime, people don’t have a website at all, and they come to us just wanting some web design and development services. We ALWAYS encourage these individuals to include SEO services with their web design project. Many see the value and sign up. Not really, though that’s what I want to do. Instead, I’ll send an email or we’ll schedule a phone call so I can explain some of the different factors that contribute to a strong online presence. 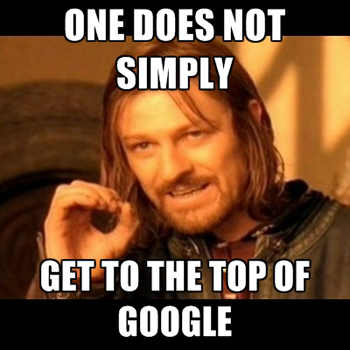 By the end of the conversation, the client typically understands that one does not simply get to the top of Google. Do you wonder why your website isn’t showing up in search results? Leave a comment or contact us at 480-451-3647. We can conduct an analysis of your website and break down the steps you need to take in order to achieve a more prominent online presence.